While the current MR development revolves around hardware such as phones with depth sensors, Microsoft HoloLens, or HTC Vive, novices shouldn’t be undermined from the learning experience. Thanks to open source alternatives such as OpenCV and ArUco library, novices can develop AR apps using webcams for image input. Unlike recent libraries such as Unity, ARToolkit and SDK’s such as Google’s ARCore, ArUco offers easy setup and deployment. 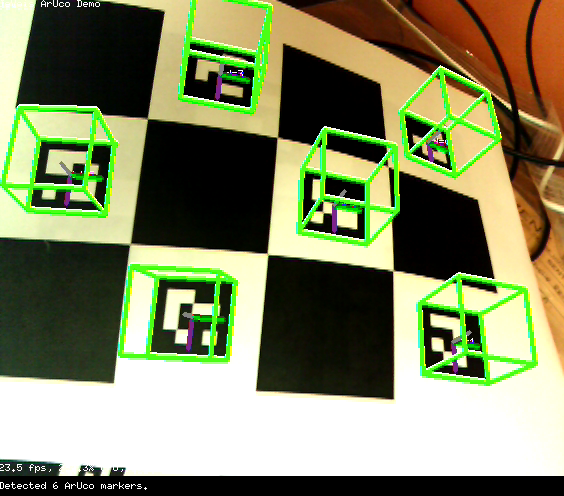 With just a few lines of code, one can develop an app for AR Marker detection and simple object rendering. Its suitable for beginning your AR journey — fast. Start the webcam : Create a camera capture object that queries the device for live video. Detect and Highlight the markers : ArUco employs special markers for object detection and pose estimation. These are lightweight squares that carry bits of information. For quick build, you can use ArUco’s inbuilt function draw to highlight the marker. First parameter is the image, Scalar(0,0,255) decides the boundary outline color(green in this case) and last parameter is the boundary width. The official repository provides a marker grid board in pdf format. Display Loop : Finally, display the image and set the program in a loop so as detect markers in live video stream. To stop, you can add a break condition. The build part may seem daunting at first(was for me). Using an IDE like Codeblocks or CLion will come handy as you develop more. For documentation, you can refer linux manpages (enter in terminalman cmake). You can get the full source code here. That’s it. Were you able to develop this AR app? If yes, please leave a comment or if you have any questions.